Installations of 6kW solar power systems will become an increasingly common sight on rooftops around Australia in 2018, largely due to the ongoing plummeting cost of solar energy components, the still-generous subsidy and better feed in tariffs. These systems may have 6kW of solar panels, but only a 5kW inverter – see notes on "oversizing" below. How many solar panels will I need for a 6kW system? That will depend on the size (output) of the solar panels used in the installation. Just as an example, if 250 watt panels are used, then a 6kW solar system will consist of 24 modules. (Note: 260 or 270 watt panels are more common these days). How much roof space is required for a 6kW solar power system? Based on a panel measuring approximately 1.6 metres x 1 metre, 40 square metres of suitable rooftop will be required for a 6kW solar power system installation. 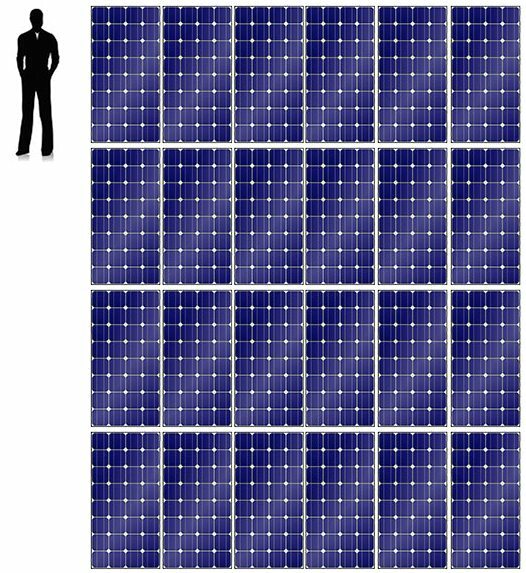 Here's a general idea of how much space that occupies, based on 250 watt panels. How much electricity generation can I expect from a 6kW system? Factors such as installation location, solar panel orientation and component quality come into play, but generally speaking a 6kW PV system should generate around 24 kilowatt-hours of electricity a day, which is more than the average Australian household uses daily. Don't forget you'll be receiving feed-in tariff payments for your surplus electricity and there will be times when the extra oomph from a 6kW system could go a long way to reducing those nasty peak period electricity costs during daylight hours (for example, costs associated with summer air-conditioning). Bear in mind self-consumption is key to getting the most from a system of this size. How much does a 6kW solar power system cost? At the time of updating this guide (Septemer 2018), the cost of a 6kW system using quality components that are professionally installed will generally range between $5,600 – $9,000. This price range takes into account the solar subsidy. What is the payback period on a 6kW system? You should see a simple payback period of around 4-5 years assuming a good installation, you've paid a reasonable price and have a significant level solar energy self-consumption. You can use our solar calculator to get a better sense of the returns. You could also be cash flow positive from the get-go if you're able to secure cheap solar finance, and not have to pay anything (or very little) up-front. While 6kW system installations will grow in popularity, solar-savvy Australians will be installing 6.6kW systems. Let me clarify – if your house is on single phase electricity supply (and most Australian homes are), then you should get a 5kW inverter and 6.65kW of solar panels. Why 6.6kW of solar panels? This may seem like an odd figure and one I've pulled out of a hat. Basically, this configuration gives you the best bang for buck – the most kilowatts for your dollars. And if you're getting a good feed in tariff (10c a kilowatt hour or more), that will absolutely, on all the numbers I've run, give you the best return on your investment. Installing solar panel capacity greater than inverter capacity is called "oversizing". It's quite common these days, totally safe, won't harm the inverter and I highly recommend it. As Australia's solar subsidy (still often called the "solar rebate") is based on panel capacity rather than inverter size, this means you'll extract the best level of incentive possible. A 5kW inverter? Why not 6kW? Aside from a 5kW inverter possibly being cheaper than 6kW, solar panels rarely produce as much power as their rated capacity for a number of reasons; a major one being temperature. Most solar panels lose around 10% of their rated power on a 25°C day, and more if it is hotter – and Australia is no stranger to warm days. Other factors affecting output include dirt and grime on the panels and wiring losses. So, by using a 5kW inverter with 6kW (or 6.65kW) of solar panels, you'll actually be ensuring the inverter is working at its designed performance level for more of the time. Another very important reason for using a 5kW inverter is that it is the maximum capacity some Network Service Providers allow to be connected to the grid. So why not go even larger and add more solar panels? Aside from rooftop space limitations in some cases, installation guidelines only allow for a maximum 133% oversize of panel capacity vs inverter capacity – and 5kW x 133% = 6.65kW. While you may not be able to get a system exactly 6.65kW, aim for as close to it as possible – but not a single watt over in order to remain within the approved oversizing limit. Even with the subsidy, solar panels are a significant investment and as with any trade, there are good installers and not-so-good. If you want to go solar and are looking for a price for a 6kW (or 6.6kW) system, you're definitely in the right place. Use our free service to get up to 3 solar quotes from installers servicing your area that I've hand-picked and trust to prepare a quote on a system that best suits your needs and circumstances. I put solar power installers through the wringer so you don't have to!